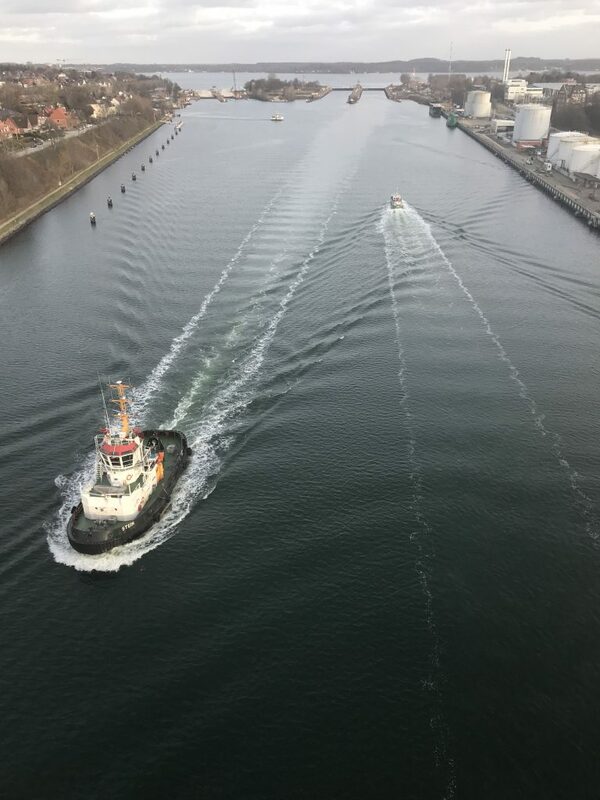 Yes, we are back to wake watching! 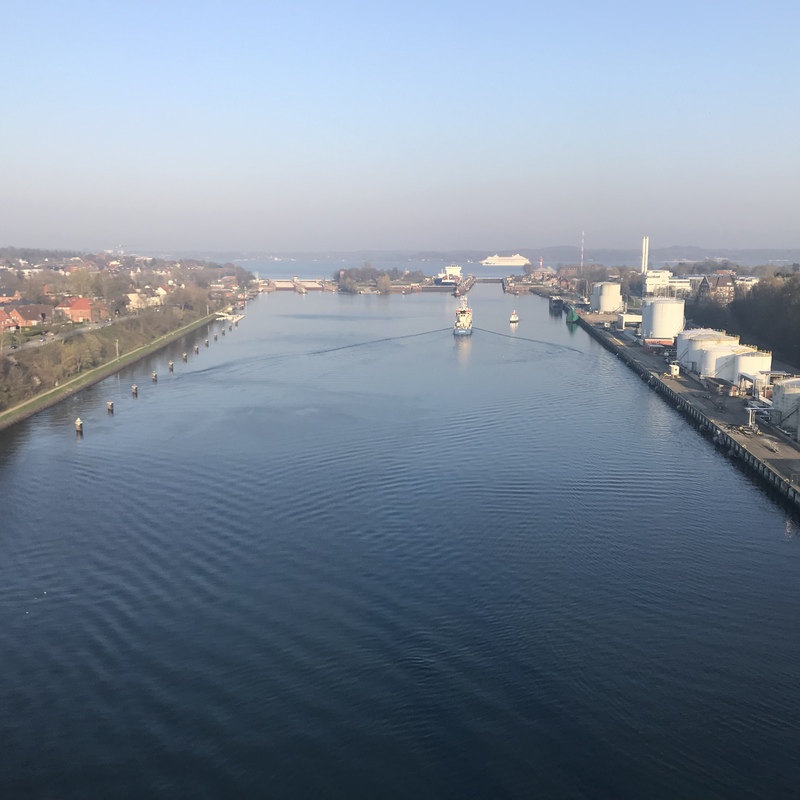 Today I went to a new-to-me wave watching spot: The bridge across Kiel canal close to the Holtenau locks, which you see in the background of the picture below. 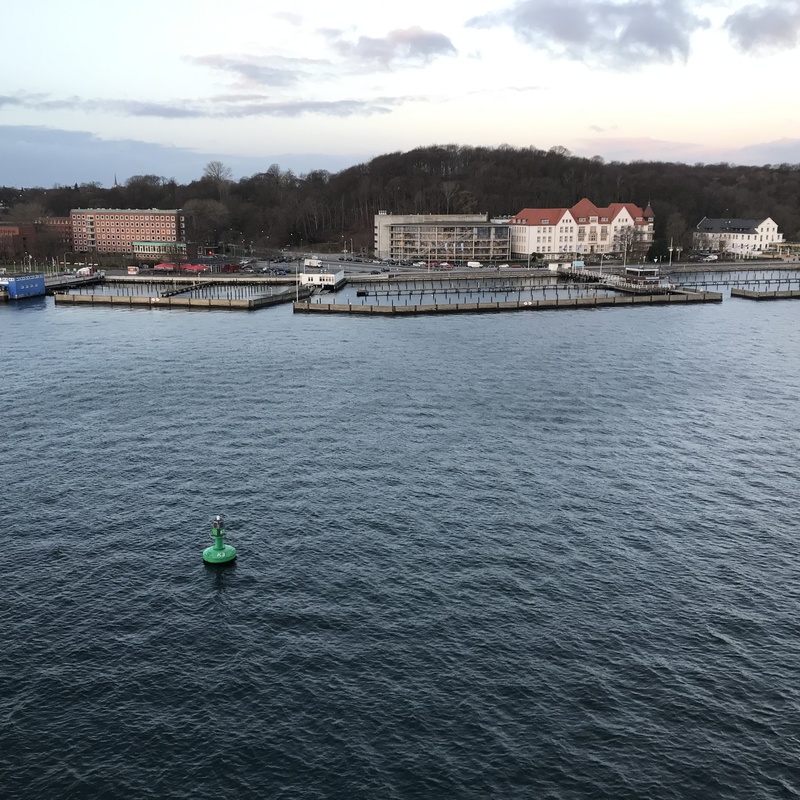 And I should have checked out my favourite ship tracking app for better timing, I had to wait for quite some time before there were any ships apart from the small ferry which you see crossing right at the locks! 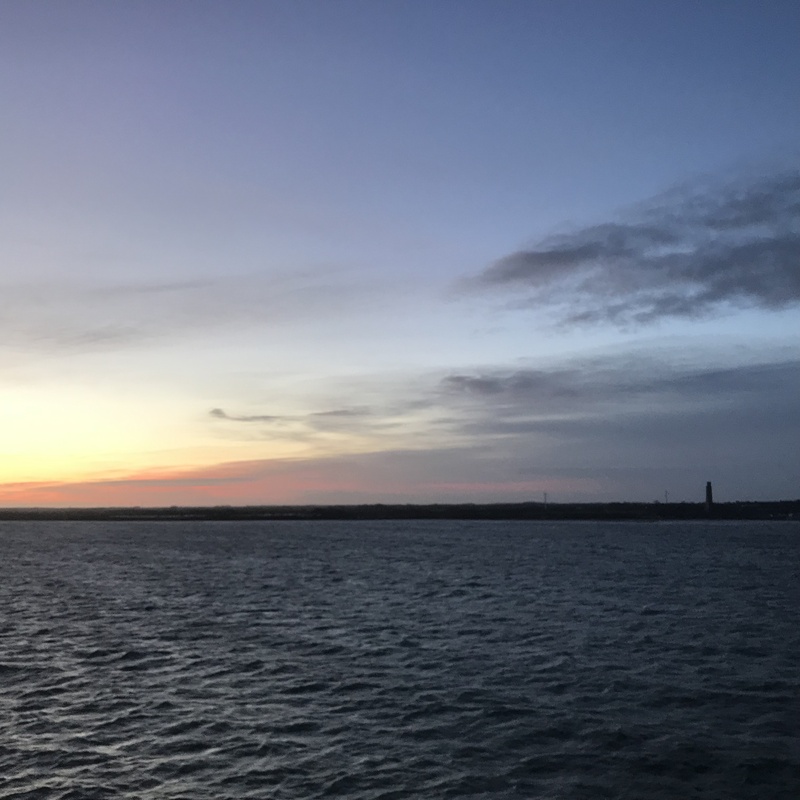 But the wait was well worth it in the end! 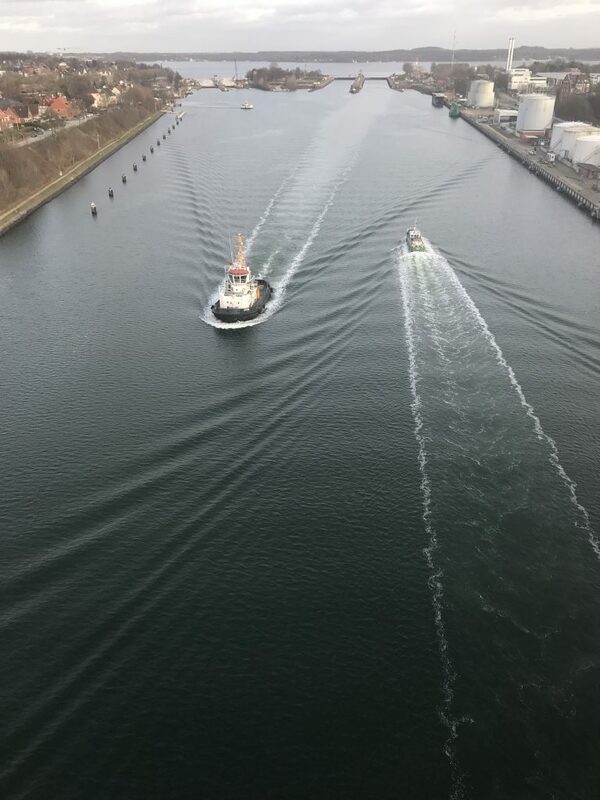 In these pictures, you see very clearly the different parts of the wake. 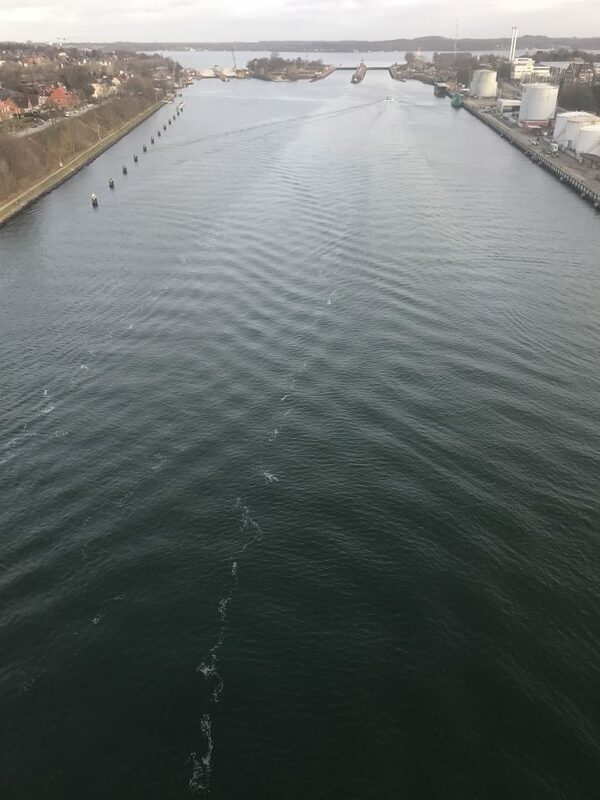 The turbulent wake right behind the ship where the ship has displaced a large volume of water and where the ship’s propeller has induced a lot of turbulence. 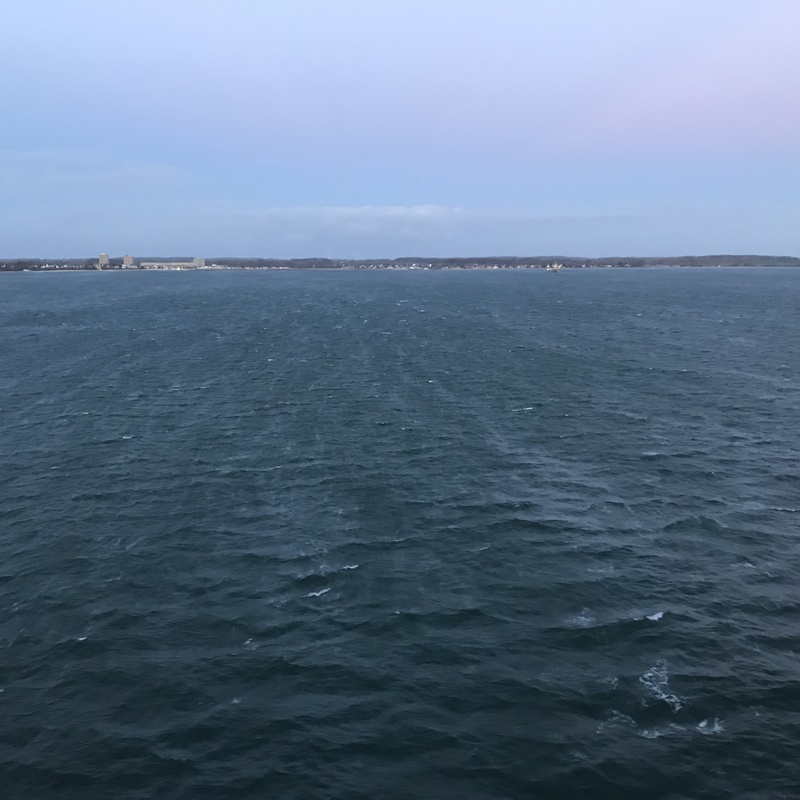 The turbulent wake is bound by the foam created by the breaking bow waves. 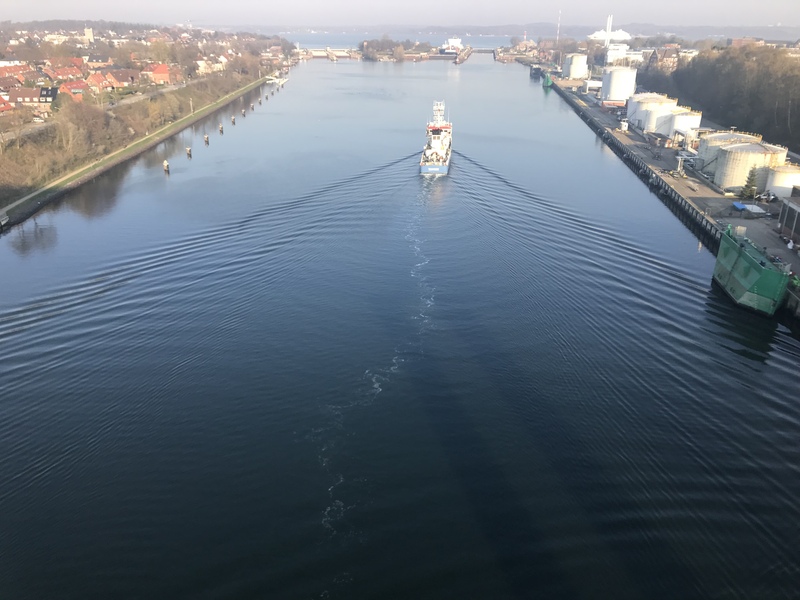 And outside of all of this, the V of the feathery wake opens up with the ship at its tip. 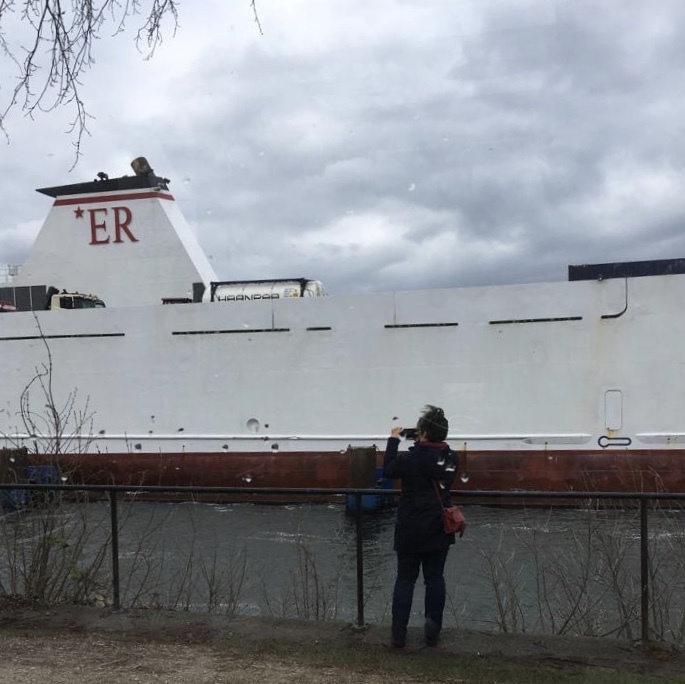 I am super excited about these pictures. 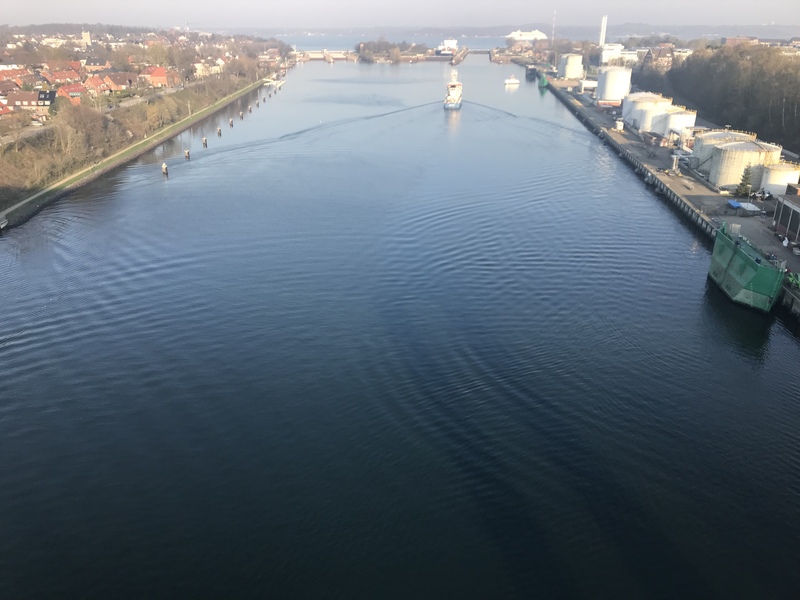 Do you see the wake reflecting on the right (south) side of the Kiel canal? 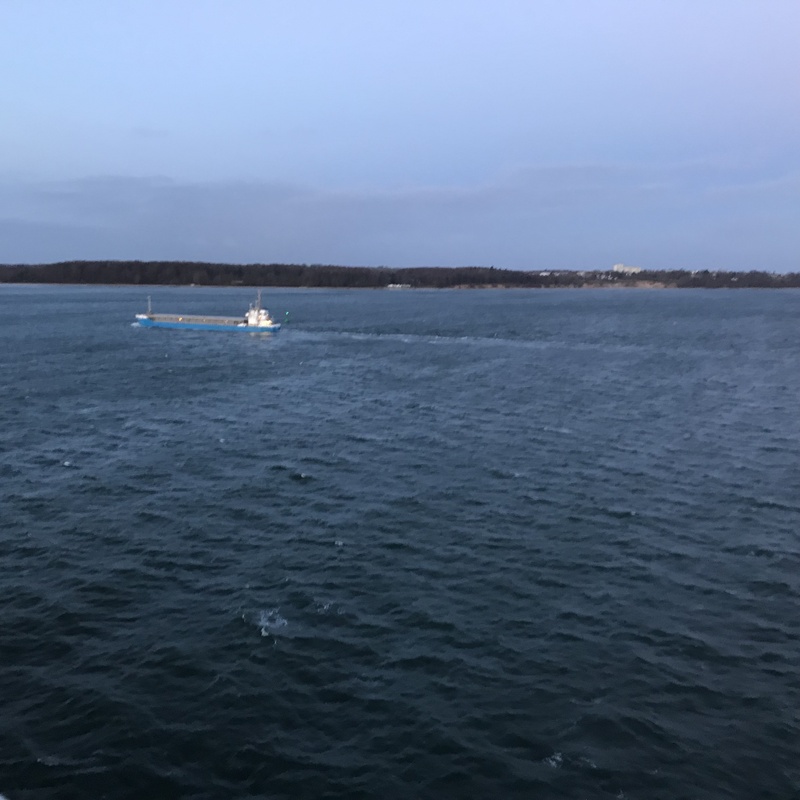 And while it was pretty easy to interpret the pictures above, and the one below is still fair game because the turbulent wake of the third ship is still clearly visible, even though the ship is not, it is getting more and more complicated, isn’t it? 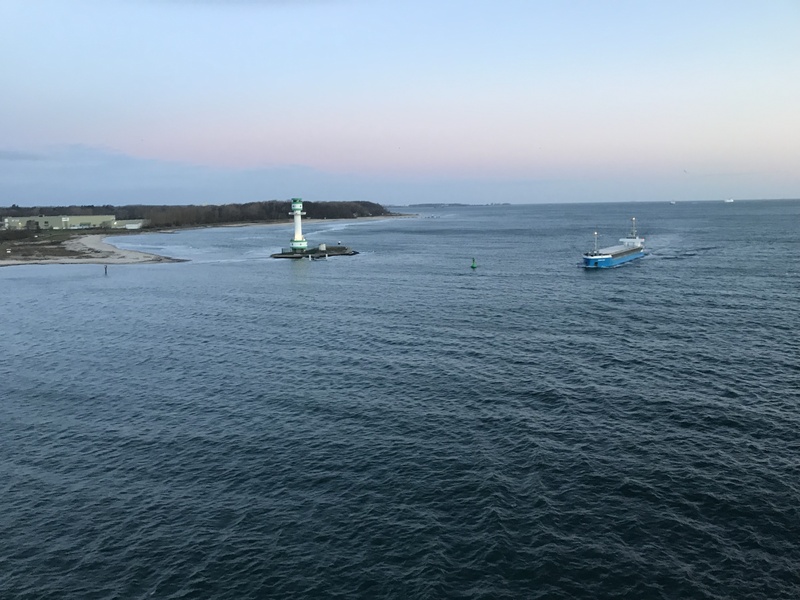 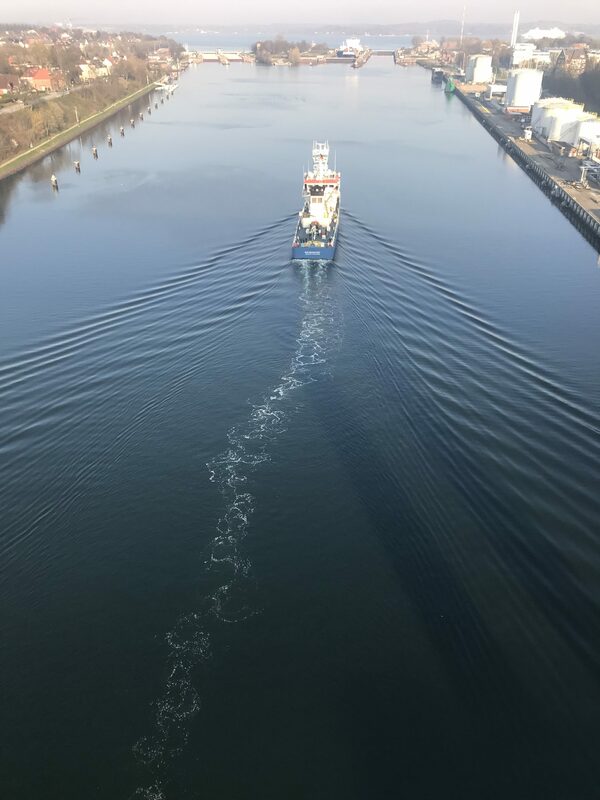 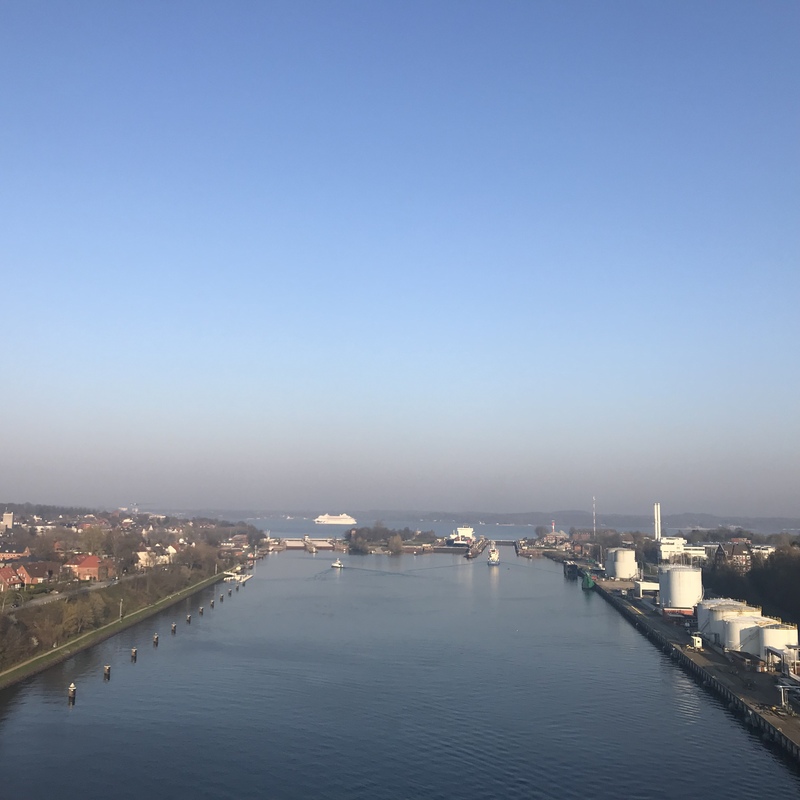 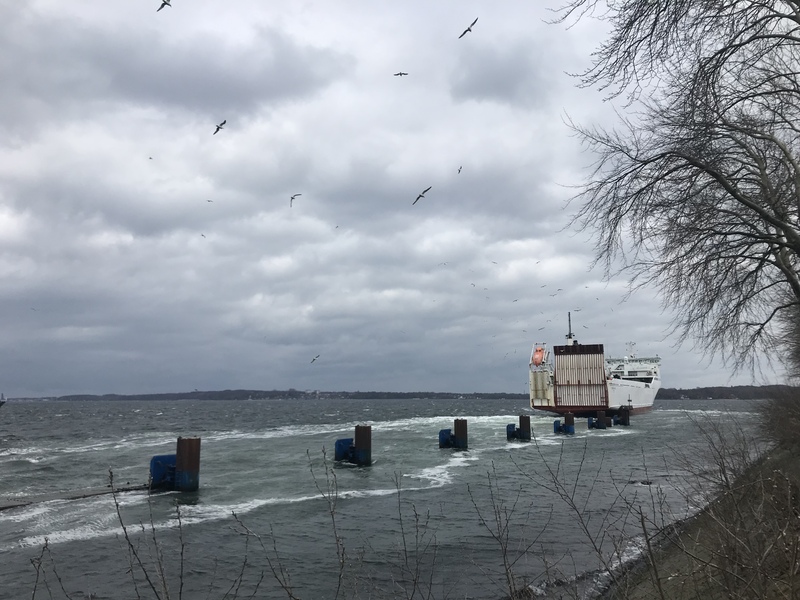 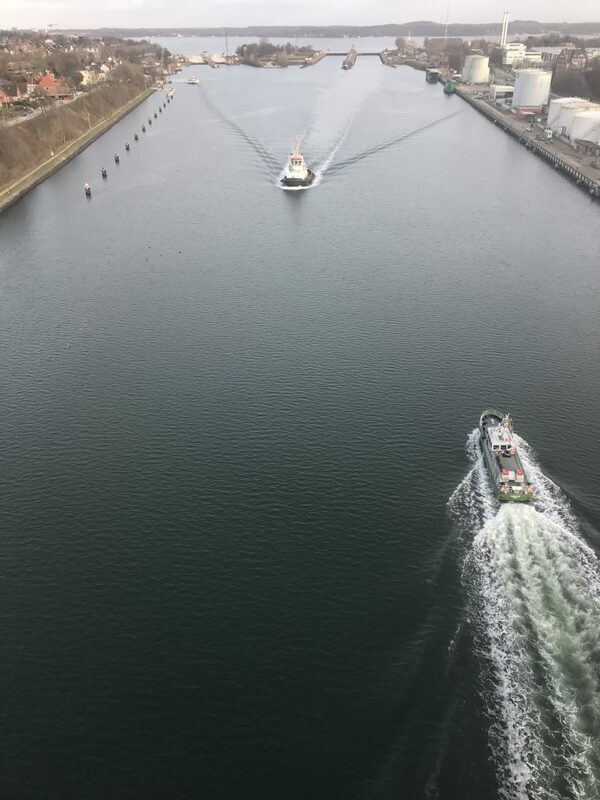 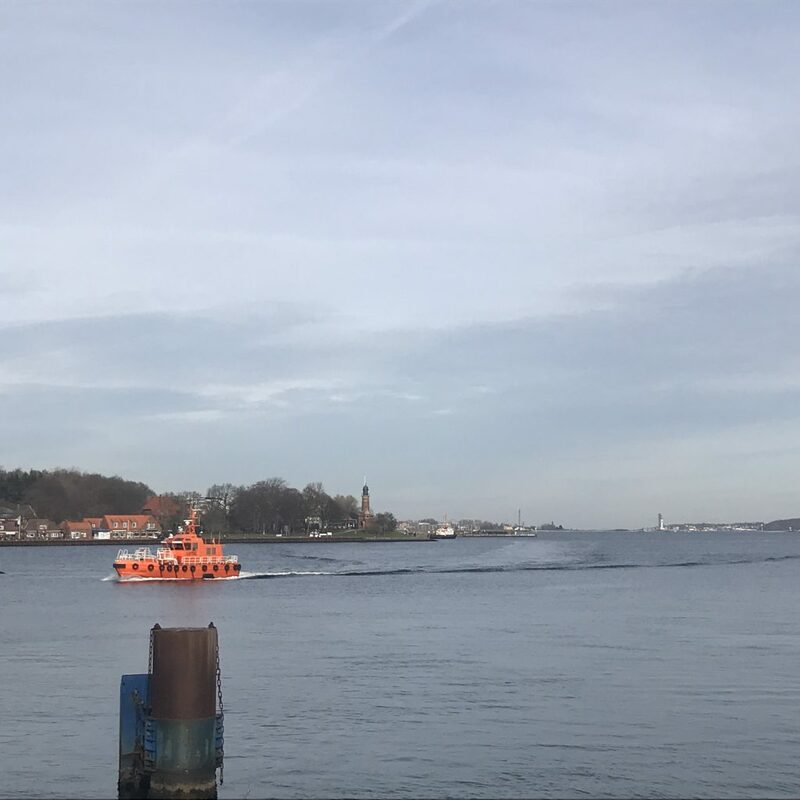 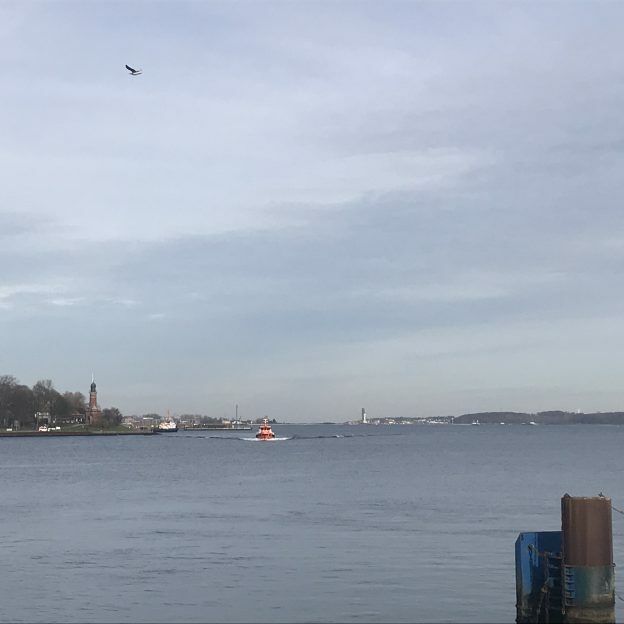 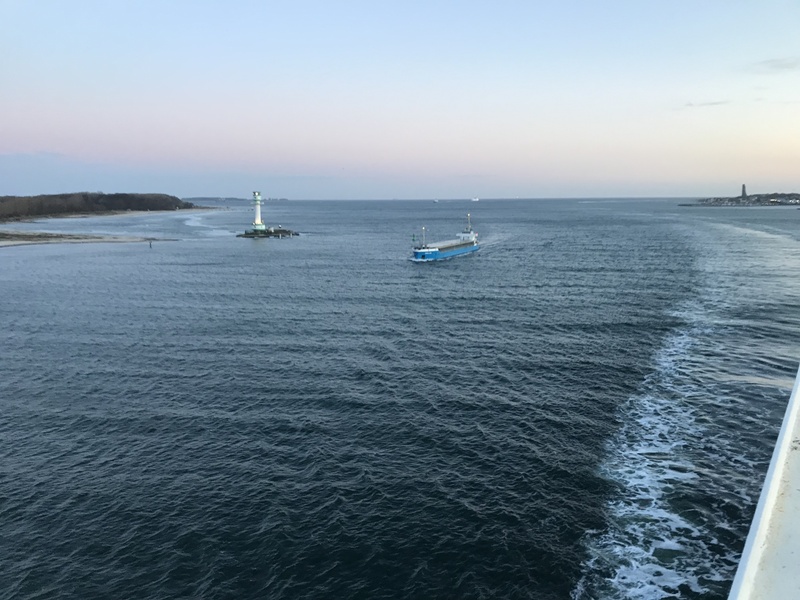 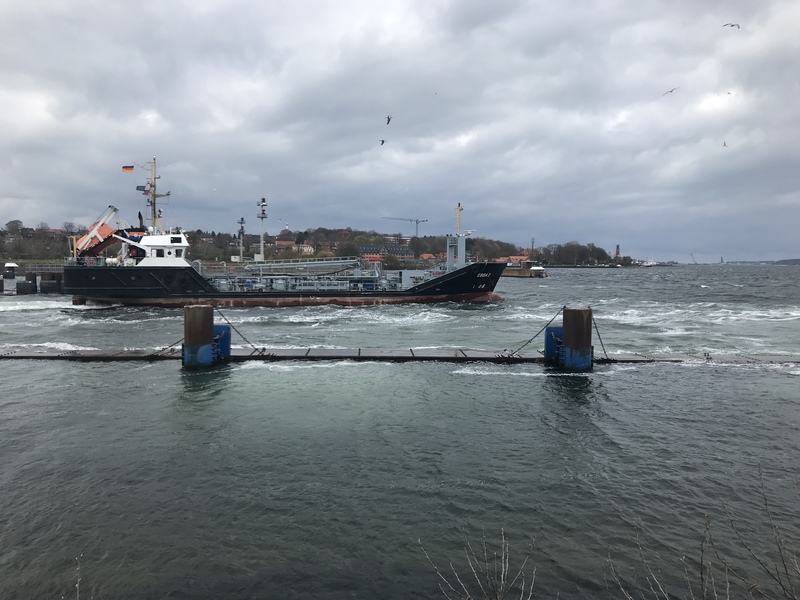 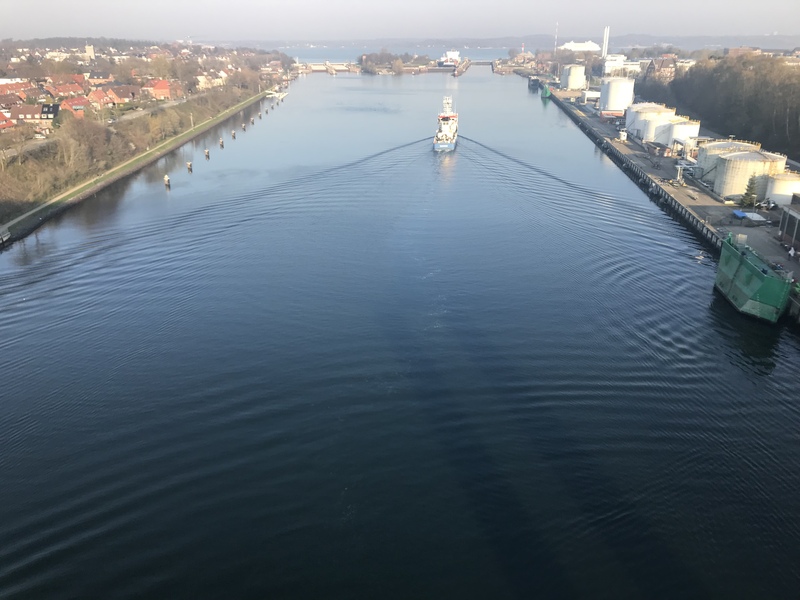 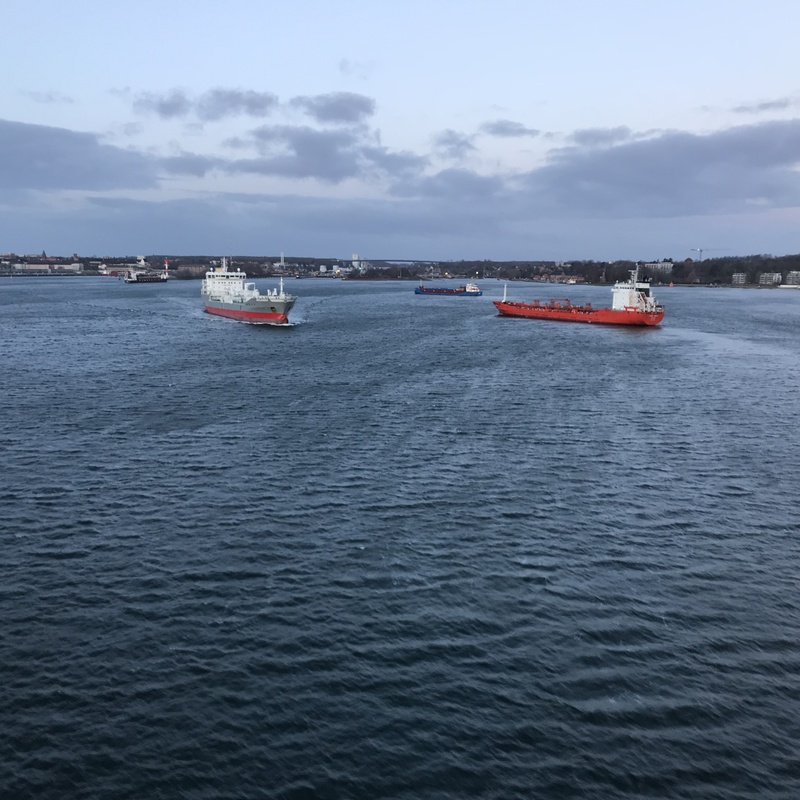 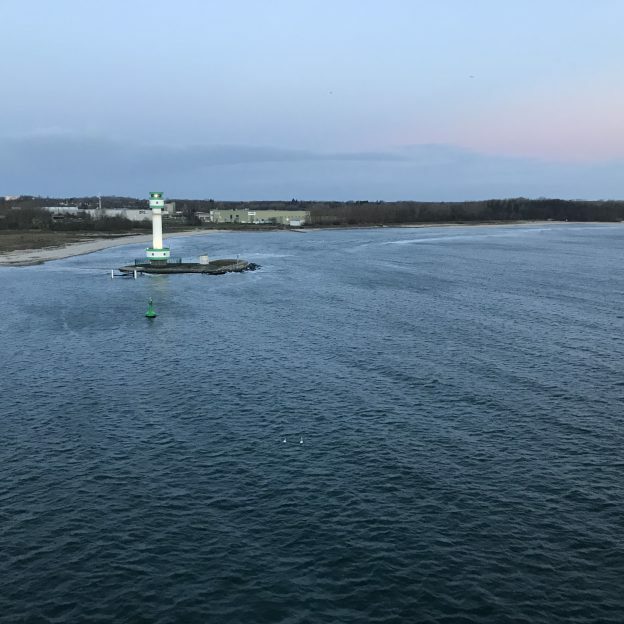 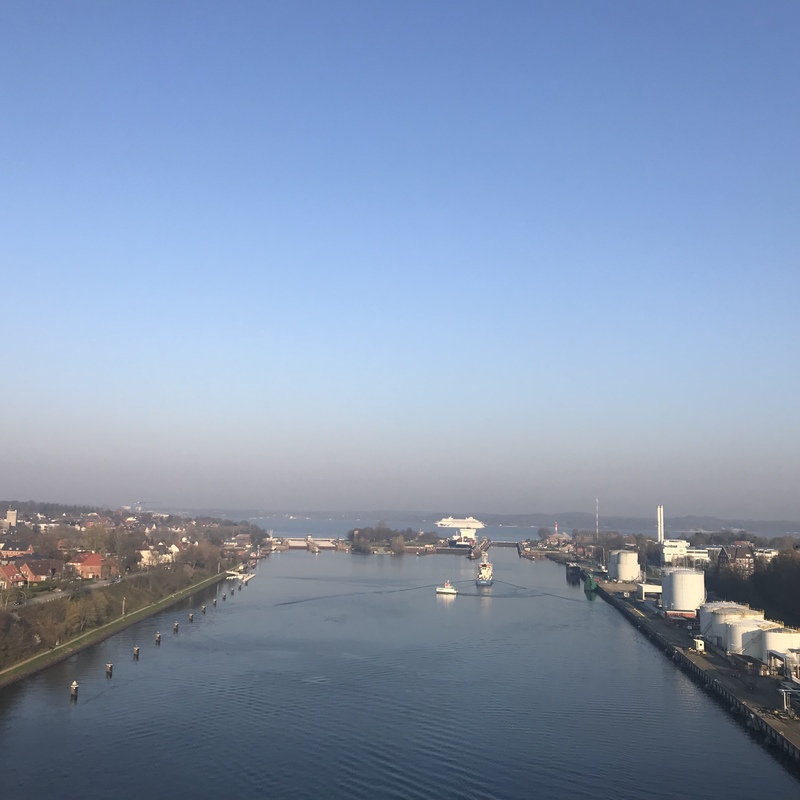 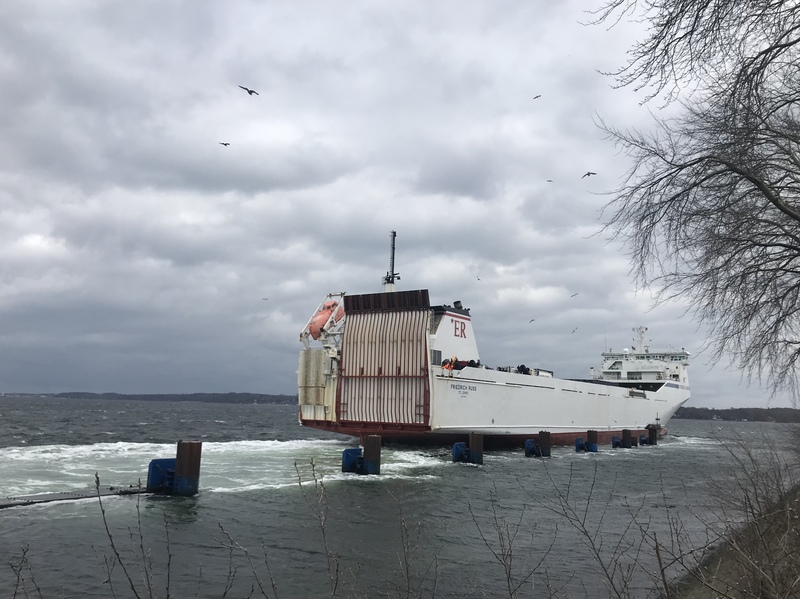 This entry was posted in observation, wave watching and tagged ferry, Holtenau, Kiel canal, lock, ship-generated waves, ships, wake, wave watching on February 28, 2019 by mglessmer. 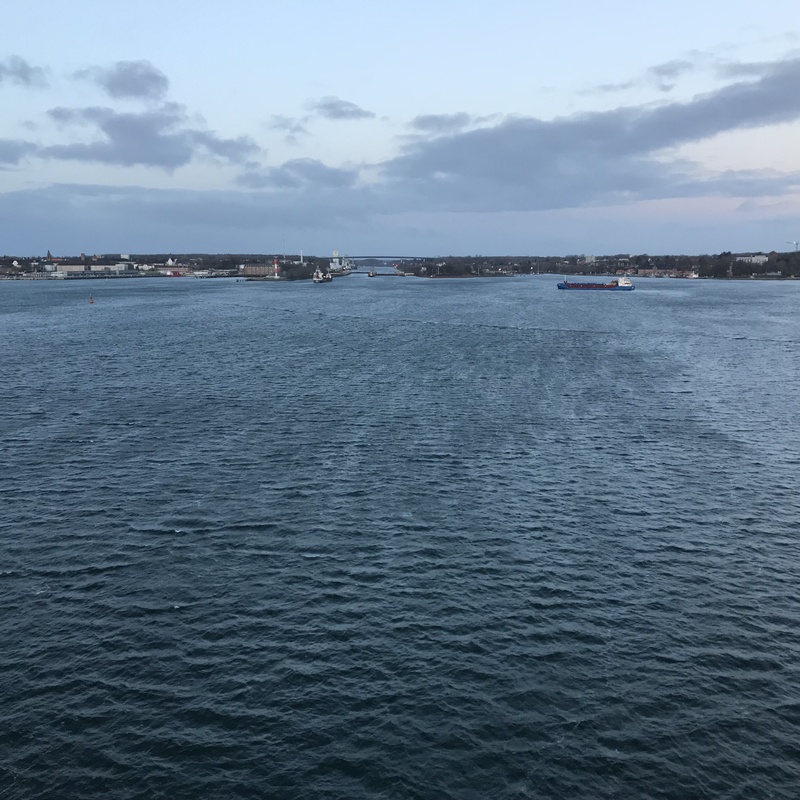 Usually I look at wakes when ships are long gone, or at least leaving. 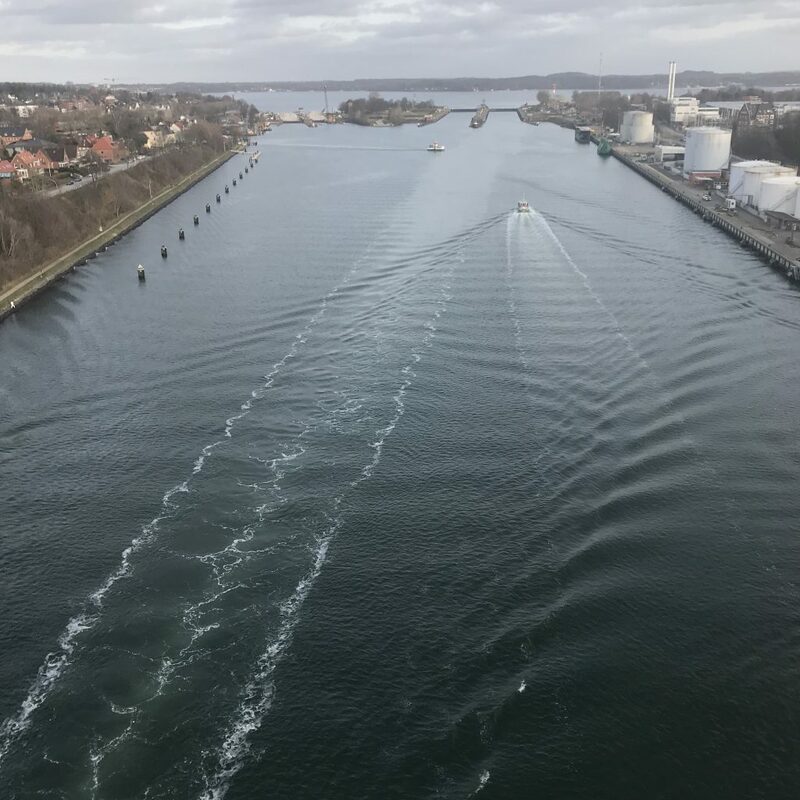 Today, let’s look at one where the ship is coming towards us and we see how a bow wave turns into the feathery V-shaped wake! 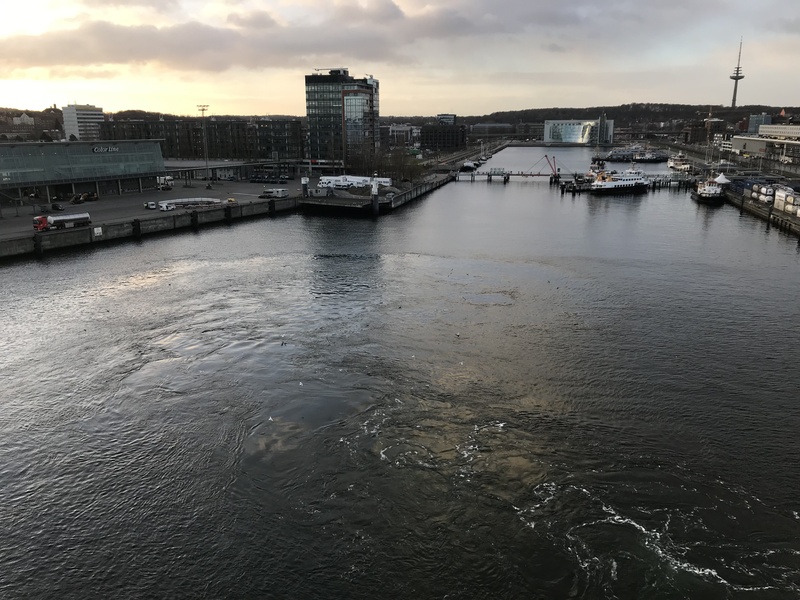 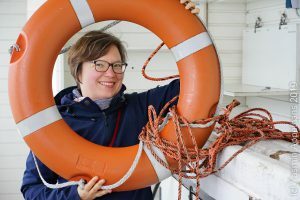 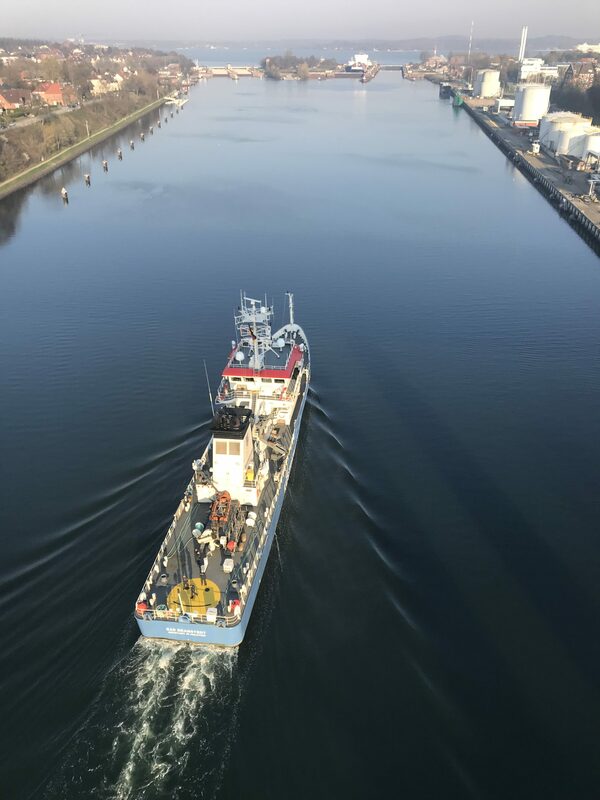 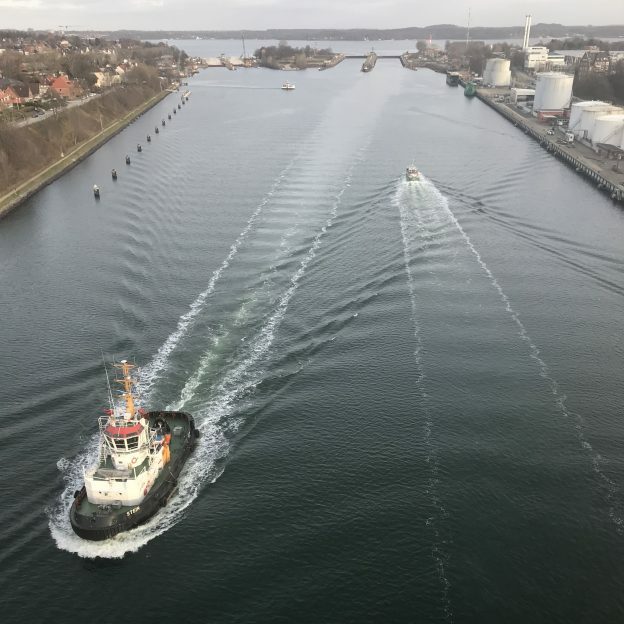 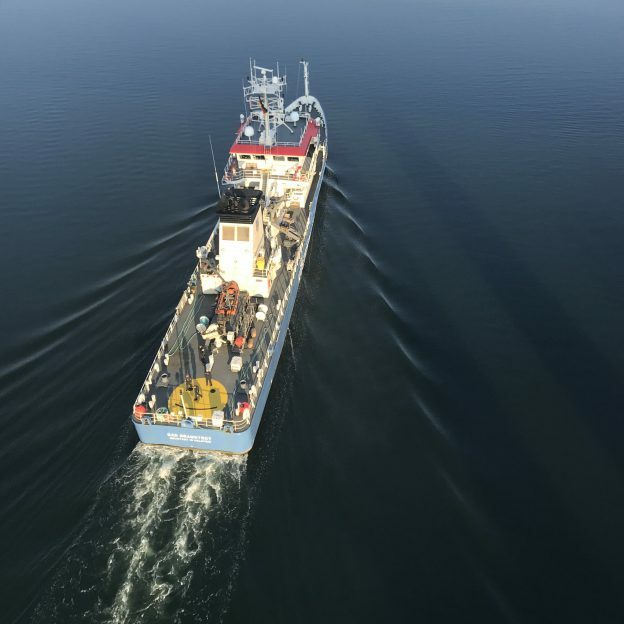 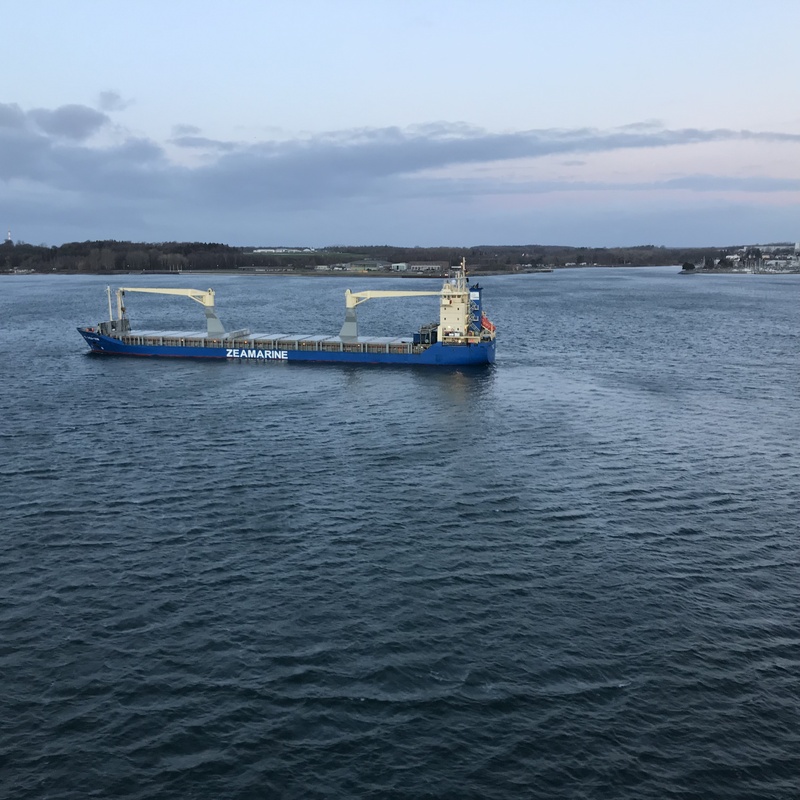 This entry was posted in wave watching and tagged bow wave, Holtenau, Kiel fjord, ship-generated waves, wake, wave watching on February 26, 2019 by mglessmer.